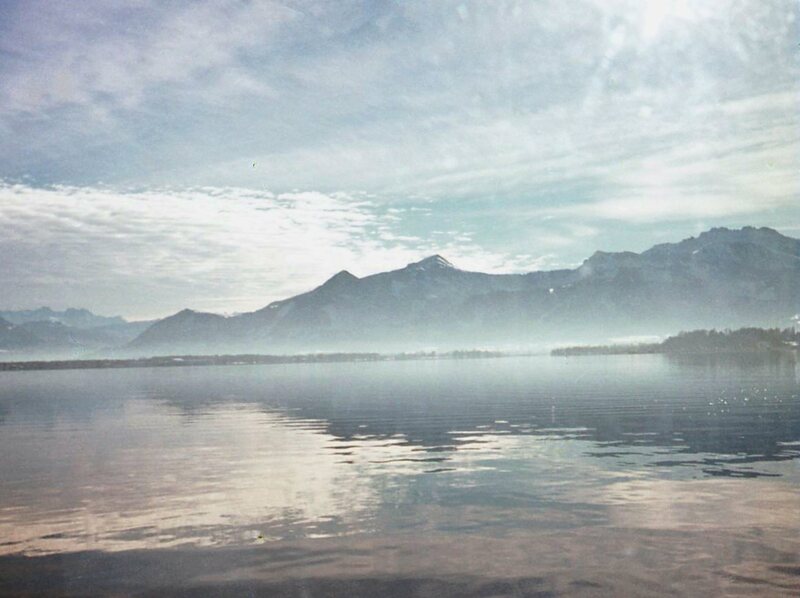 Daddy took this photo early one tranquil morning at Chiemsee, Germany, November 1972. Could you use some calm and tranquility right now? I know I could. I’m writing this in the wee hours of the morning, having been unable to go back to sleep after being awakened in the night. It’s an all-too-common situation; I fall asleep exhausted, but if I wake up (whether on my own, or due to environmental noises) I often lie awake fretting over all the cares that await me as soon as I get up. I’ve dealt with insomnia long enough to know that lying in bed worrying is not a good precedent to set, and can become an escalating threat to future sleep, so I try to switch gears and look at it as a gift of time. Often I’ll choose to get up and go to work in the blessed quiet of those predawn hours, promising myself an extra-early bedtime later. This morning, though I had planned to tackle a few projects I had been dreading, I ended up getting distracted by looking through some happy photographs. The transformation from self-pity and anxiety to a feeling of gratitude and joy was remarkable. I’m sure I’ll be yawning in exhaustion this afternoon, but I hope that the mood-boosting reminders of abundance will stay with me. The problems that had me lying awake aren’t going to vanish, but I can choose to make them better or worse, depending on what I pay attention to and how I react. I invite you to join me and “just say no” to a mental diet of junk. As with healthy food, exercise or other aspects of wellness, it might take awhile to cultivate a taste for what is admirable, right, pure and beautiful; we live in a world that seems determined to focus on doom and gloom and useless hand-wringing. But I think the rewards of setting up sentinels to guard our minds and hearts are well worth the initial effort. What thoughts, activities, poems, prayers, or practices can you rely upon to give you a quick attitude adjustment when you most need it? Feel free to share your favorite joys with us, and let’s build that fortress of calm and tranquility, one intentional moment at a time. Good morning, Julia! So true, and what a lovely, peaceful photo! So is this where your photographic talent comes from? A couple of weeks ago, someone challenged me to post one nature or wildlife photo each day for seven days (you can imagine how hard it is to select just one!) using the hash tag #challengeonnaturephotography on Facebook. 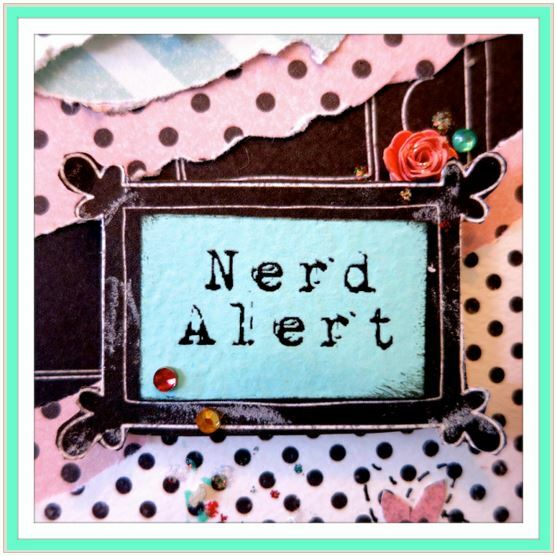 I made it through six days, and then went on vacation …. P.S. I had a night of poor sleep, so I read your post around 4 AM – and was then able to get back to sleep, bless you! Meanwhile, I’m happy you were able to get back to sleep. I have unfortunately passed back into a phase where getting enough sleep is quite a challenge, so I sympathize with anyone who has to deal with it even occasionally. Julia, that is so cool! I wish I could see your “cardboard box and papers” pictures! Exercising creative imagination is such a pleasure. I just realized that my photo “post-processing” with Photoshop can be a bit like that – creating what I wanted to see (like a level horizon at sea – ha!). Susan, I can’t count the number of times I have had to level the horizon and then crop. I love the “rotate” tool. Someday I hope I have time to explore all the seemingly endless creative effects that can be achieved relatively easily with good software. I go through bouts of insomnia… ad I know well that feeling of lying in bed fretting. If I want to stay in bed, I put my headphones in and listen to an audiobook – something familiar and lighthearted that I have heard before… often I go right back to sleep. Other times I get up and knit or crochet… again to the accompaniment of an audiobook (although in this case it could be something new to me or more exciting since the point is not to fall back to sleep)… there will always be a huge mug of tea too. I should try the audiobook thing myself sometime. Maybe I could try something long and boring, that is read in a monotone voice, as some of the less entertaining audiobooks are. In my teens I learned to crochet, thought I never got past anything but the basic “granny square” stitch, but I do remember finding it quite relaxing. That mug of tea is always beside me, too, once I decide to get up and make a day of it. In fact, I have one sitting beside me right now! 😀 Hope you have a great weekend. Marlene, we must be twins separated at birth. So many of the things you say sound familiar. In 2000, during the crisis of Matt’s first manic episode, when none of the doctors could figure out what was wrong with him and nobody in our home was able to sleep more than 1-2 hours at a time, a friend told me about Rescue Remedy (for me) and I had a bottle in the drawer of my bedside table for months. I could never be sure whether it helped or not, but it certainly didn’t hurt and perhaps it had at least a placebo effect. I have a bottle of Calm (the magnesium supplement) on my counter as I write this, and I can definitely tell it does make a difference in my sleep quality. Many years ago, Matt’s developmental pediatrician prescribed Magnesium Taurate as an alternative to the drugs that other docs had prescribed to help him sleep when he was manic or hypomanic. It worked wonderfully and he has been on it ever since. Way better than any prescribed sleeping pill. Sorry about your fall. Hope whatever soreness it may have caused is gone now. WOW, to think that photo is not far from your grandparents’ home! How cool. That photo brings back memories of a very enchanted time. We were in Europe for the first time ever, visiting friends who lived in Heidelberg, and we were on a road trip that made many gorgeous stops. We were at Chiemsee for Thanksgiving day, I believe. We had our Thanksgiving dinner in a restaurant overlooking that lake, at the army rec center in Chimsee, which was taken over from Hitler after the war. It was only the second time I had a Thanksgiving dinner without my cornbread dressing, but it was worth it. You can see the dining room where we had our meal if you scroll down the photos at the link. The site was closed by the U. S. Army in 2003. It was still quite lovely in 1972. I remember we had Baked Alaska Flambé for dessert, the first time I had ever seen anything flamed with cognac. We stayed in the hotel, right on the lake as you can see in the photos, and my brother and I had a lot of fun wandering around and imagining the place being a former Nazi hideout. I think it was the night before that, I had Wienerschnitzel for the first time. I did not have adventurous tastes but I do remember thinking it was very good. You make me smile, Julia. I’m all about natural remedies for anything. My sister who was diagnosed with everything from Bi-polar to Borderline Personality disorder was the one who introduced me to Rescue Remedy. I have an anxiety disorder, and we both have attachment disorder which I think is the root of it all. The list of things could go on and on. I took anti-depressants for years and found more natural ways of dealing with it. I choose to focus on the healing, not the problem. You have some wonderful memories, of your time there. My grandparents ended up in Friedrichshafen on the Bodensee (Lake Constance) when they finally settled after the war. A tiny apartment that overlooked the lake. I loved spending time there. It’s our good memories that see us through tough times. They closed most of the bases in Germany but Heidelberg was still open last time I was there. Had to take mom to the doctor there. I guess there is a twin out there for each of us. :)) Giant squishy hugs. Marlene, I’ve been so happy to see that mainstream allopathic medicine seems to be increasingly open to augmenting their pharmaceutical solutions with the use (or at least awareness) of other facets of wellness such as meditation, diet, exercise, herbal remedies, etc. I think people are so different in their responses to various remedies, whether pharmaceutical or not, that it pays to be open-minded about SAFE trials of various treatments. One thing Jeff’s 3.5 years of fighting cancer has taught us is that medicine is still a very inexact and often surprisingly crude science. And I tend to strongly favor focusing on wellness and healing, as well. It might not get instant results, but at the very least it will increase our stamina for enduring the aforementioned crude medical interventions that are often necessary to save or prolong a life. YES, our good memories do see us through the tough times. They are like buried treasure that sparkles when we unearth our mental stash. I think that’s why I love photographs so much. They are like maps to the buried treasure. Without the photo of Chiemsee I might have forgotten (or wonder if I had only imagined) its magic. Heidelberg is lovely in my memory. In our York dining room, I have an original etching of Heidelberg overlooking the Neckar River; my mother bought it from the artist when we were there in 1972, and gave it to me about 20 years ago as a sweet memory. Now it’s a cherished addition to our home. That is a stunning photo, Julia. I used to do what you do and get up and busy myself with other activities. I just can’t get by anymore with that interrupted sleep. I’ve learned to practice my yoga or mindfulness breathing techniques and they really work. Another suggestion is to down load a meditative app on your phone and listen to it with your phone tucked under your pillow. It pulls the focus away from all the stress and strife and draws you back to your breathing. It’s worth a try. Sleep is so precious, isn’t it? Alys, your comment reminded me of a Delta Wave Sleep CD a friend gave me a long time ago, which I used to listen to on my Sony DiscMan and it really did help me sleep. Later I transferred it to MP3 and I still have it somewhere. I need to dig it out and try it again, thanks for the reminder! I do intend to take Yoga sometime. I try to do the breathing as I learned it in meditation classes I took with my Mom during one summer I was home from college, but sometimes I can’t even stay focused on that. I do agree that sleep is crucial and should be prioritized even over eating well. Not getting enough sleep can make anybody crazy. Julia, staying focused is hard when we’re in crisis. I’ve been told that part of why the call it a practice or “mediation practice” is because we have to do it over and over again to make it part of our days. I’ve just purchased a book from a fellow blogger on mindfulness, gardening and her recovery from breast cancer. I’m sending you a copy soon. Oh, thank you Alys! Yes, as with so many other things that may first seem simple, PRACTICE is key. For those of us whose minds often run in several directions at once, it’s all the more crucial. I’m reading more and more about the benefits of mindfulness to our overall good health. I am too. I think just reading about it calms me, sometimes! 🙂 I have always believed there was a very close and not fully understood connection between the mind and what we think of as illness or wellness. It’s good to see integrative medicine is finally catching on. “I Can Only Imagine” and “Fix Your Eyes Upon Jesus” and “Overcome”. The chorus “all authority…”& the last verse about “the word of our testimony” come to mind often & are very powerful tools to clear my mind, getting back to praise & gratitude; so I can function…. Mary Ann, thanks for sharing that song– I have never heard it before even though we do sing a lot of contemporary songs at church. I do love “I Will Call Upon the Lord” and other songs with a lively beat. I also find great comfort in some of the African American spirituals; didn’t we sing them sometimes at Fairfield? We sing many of them at our church here, and I love it. Singing is a powerful antidepressant. I’ve read in several places that the therapeutic effect of music, and especially singing, has been documented by research. I am sure we will be singing one of my longtime favorites on Sunday — “Up from the Grave He Arose.” 😀 Happy Easter! Beautiful PHOTO!!! Your dad got a great one! Thanks Mary Ann. The photo is doubly precious because of the memories it brings back. Writing a God-centered poem. Nature. Walking and hiking. Calling friends and family to wish them a good day and share news. Writing abut what and who I love. Making art and music as well as viewing and listening to others’. Dancing to music that is light and lovely. Seeking God’s Love and wisdom via reading Scripture or prayer. Reading meditation books. Being grateful for at least five things a day–usually there are many more! Cynthia, I might print out your comment as a quick reminder of things to do when I get rattled or overwhelmed. A sort of psychiatric “to-do” list! All of the things you list have been immensely helpful to me at difficult times. A couple of decades ago I kept a gratitude journal of 5 things a day; I didn’t keep it more than a few months, but when I do go back and read it now, there are so many small blessings I would have forgotten about. Thanks for your inspiring thoughts! I see it as my spiritual maintenance work and play. Have to do it and it makes me happy to, so why not?! Glad you found it helpful 🙂 Blessings of God’s Love on this Good Friday and a peaceful Easter. Thank you Cynthia. Isn’t it strange how often we forget to do those things that we know are right, good, and uplifting? This was a difficult week (due to Jeff’s health problems) but we were indeed blessed with an extra measure of comfort on Good Friday, as well as on Saturday and Sunday. Hope you had a wonderful celebration as well. They tell me and I have found it to always, always, always be true that there is one prayer that is eternally answered. Many times I have been awakened by worry and all other sorts of circular thinking and after someone tipped me off to this prayer I begin trying it and found that I was waking up later on with acute awareness of His Unending Mercy. Harry, I never really thought about it until I read your comment, but that is probably the prayer I’ve said most frequently over the years, and especially lately. I guess that says something about whether I pray more in times of trouble than in happy times, although to be fair, I probably say “thank you” at least as often, but not usually in the anguish that prompts me to beg for mercy. I agree with you that it is “eternally answered.” It reminds me of what Daddy often called “the prayer that never fails.” In the the final years of his life, when his COPD would awaken him in the night with the panic of struggling to breathe, he would pray — “Lord, give me the peace that passes understanding” and his experience was much like yours of the prayer for mercy. Not surprising, since they are so similar. As a side note — praying so often for mercy has made me keenly aware of the need for us to show mercy to others. Micah 6:8 says we are to LOVE mercy. Not simply “show mercy” but LOVE mercy. I think life itself is teaching me to love mercy more and more. Amen, Harry! No matter how good a day I am having, there seems always to be at least one or two moments when I feel the need to say that prayer! As I write, it is Easter evening, and I’m hoping you’ve had a day of peace and smiles, and that you have recovered from the lack of sleep. Even still, I’m glad your trip down memory lane produced happy thoughts, and that all the comments you received have been helpful. I don’t have anything else to add except my friendship and love. LB, your friendship and love are more than enough! Thank you, thank you, thank you. 🙂 BTW, I have the lovely handmade card you sent me some months ago STILL sitting out on my dining room table, waiting for my having the time to answer it thoughtfully. Till then, please know that I LOVED it. I treasure such global connections and I love to see the artwork of women from all over the world, a true win-win situation!